Narrow window of entry (11-14 weeks with ideal entry at 11-12 weeks). The combined screen for fetal aneuploidy requires 3 components, as outlined by the Fetal Medicine Foundation. maternal age to provide a single overall risk estimate. Results should return within a week or sooner. The results will be faxed directly to the referring physician office. If the patient has had a formal counseling session, the genetic counselor or physician may phone the patient directly, if previously approved by the referring physician and patient. 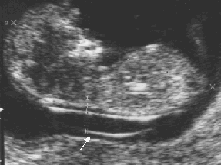 Like 2nd trimester screening, results are typically returned as "Within normative range" or "positive". The basis for these designations depends on the overall calculated risk, based on the combination of maternal age, ultrasound measurements, and maternal biochemistry. The risk of fetal Down syndrome in a 35 year old woman (1:270) is typically used as the threshold for making this determination, so that all risks less than this will be termed "within normative range" and all risks higher than this are termed "positive". Note that the positive indication does NOT indicate that the fetus has Down syndrome, only that the risk is considered to be high enough that the woman may want to consider further diagnostic testing. It is far more likely that the fetus is completely normal. For example, a risk of 1:200 would be considered "positive" but the odds are that 199 of 200 cases the fetus will be normal. Statement by the Fetal Medicine Foundation. The Fetal Medicine Foundation promotes screening for Down syndrome at 11-14 weeks by Nuchal Translucency or a combination of nuchal translucency and maternal serum biochemistry.